Newtok doesnt intend to lose itself to the creep of climate change. Of more than two dozen threatened Alaska villages, Newtok is the one farthest along in efforts to relocate to new, higher ground. 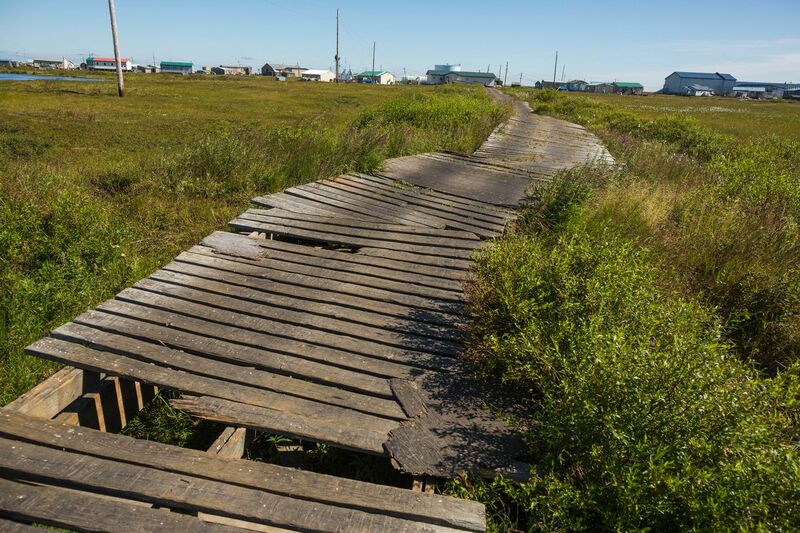 NEWTOK – The only way to reach the village of Newtok from the airstrip is across an old wooden boardwalk so crooked and broken that a person on foot risks falling between gaps in planks into the marsh below. The school principal hauls his own honey bucket. An aide at the health clinic lives with four others in a one-room home where duct tape patches cracks between walls. Homes tilt at crazy angles after years of sinking unevenly into thawing permafrost. While new houses and modern water and sewer systems lift up lives in some rural communities, government agencies as of late see little reason to invest in eroding villages that everyone is preparing to leave behind. The boardwalk leading from the Newtok airport to the clinic, on Tuesday, August 4, 2015. With efforts underway to move the village to a new site, the existing infrastructure has been neglected. 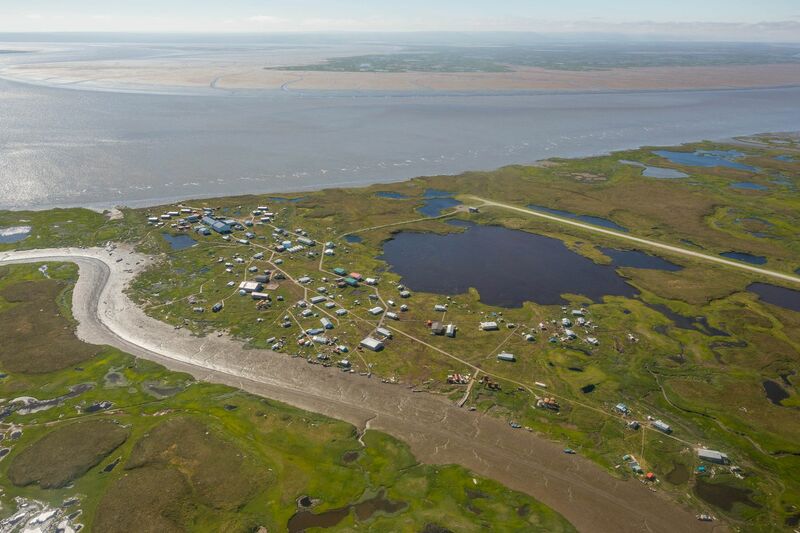 This isolated Southwest Alaska community is disappearing as the land sinks, sea levels rise and the bordering Ninglick River gobbles up an average of one-fourth of a football field a year. "My house used to be down there by the pond, and they had to drag it up here," said Elsie Stewart, 49, standing on the front steps of her home, moved a few years back after a flood. The hide of a musk ox hunted by her brother lay drying outside. She knits the fine yarn spun from qiviut, the down, into scarves and smokerings, or nachaqs, as part of the Anchorage-based Ooomingmak cooperative. With severe erosion and flooding in Newtok, Stewart is unsure the place she was born and raised will be there for her own children. But Newtok doesn't intend to lose itself to the creep of climate change. Of more than two dozen threatened Alaska villages, Newtok is the one farthest along in efforts to relocate to new, higher ground. The village, about 500 miles west of Anchorage, has more than 350 residents, including about 150 schoolchildren. Conversations on the boardwalk begin in Yup'ik. Herring on strands of braided sea grass dry on racks. With no access to showers, people get clean in steam baths heated with driftwood. Kids of all ages play basketball in front of the old, boarded-up Bureau of Indian Affairs school. Some young girls chew tobacco. Boys with BB guns take aim at birds. In early August this year, families had just picked gallons of salmonberries, blueberries and blackberries to freeze for akutaq. Men were preparing for moose hunting. Across the widening Ninglick River, on a rocky Nelson Island hill, the start of a new village catches the sunlight on a rare blue sky day. Nine miles away from Newtok, there's Mertarvik, Yup'ik for "place to fetch water," named for a freshwater spring. "Knowing what is going to be the future, this is the promised land," said George Carl, Newtok Village Council vice president. Mertarvik, the village of Newtok’s relocation site, on Wednesday, August 5, 2015. 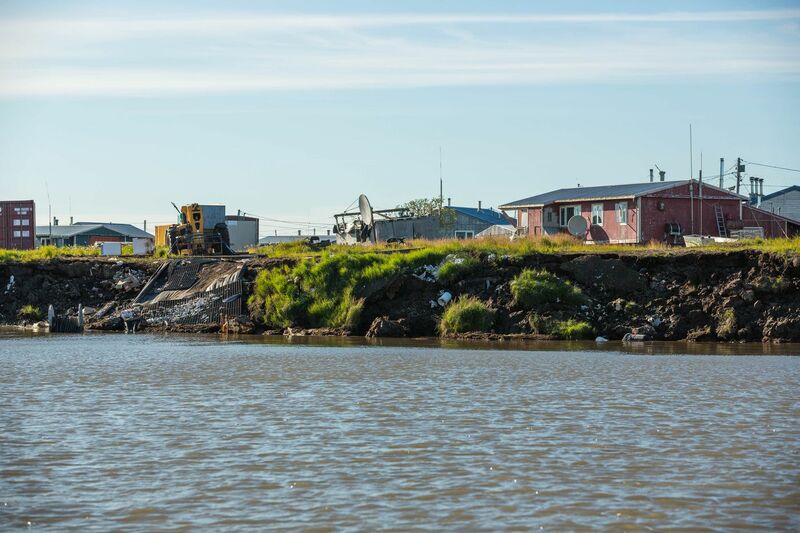 The land around Newtok has been eroding, forcing the community to relocate to higher ground on nearby Nelson Island. Six homes are finished, including three never unoccupied. There's a barge landing, storage buildings, a roadway reinforced with durable mats, a well, a leach field and the start of an evacuation center. There, Newtok residents say, life will be different, with everything clean, modern and unbroken. Life will be the same, too, with familiar hunting, fishing and berry-picking grounds, with people in the tightly threaded community staying together, despite some unsettled, painful rifts. The adventure of it is a lure, too. "I can't wait until we move over there," said Charlotte Charles, a 12-year-old riding her bike with friends on the boardwalk one evening in late summer. Schoolchildren learned about village erosion for class, she said. They saw big cracks in the land. Tribal leaders are part of a team of regional, state and federal agencies that organized nine years ago and are figuring out the steps, staging the move in pieces and stumbling at times. Challenges weigh heavy: staggering costs, piecemeal funding, delays from a tribal dispute, and, state audits say, mismanaged construction of a critical piece, the still-unfinished evacuation center. Newtok's crumbling land connects it to the bigger planet in a new way. President Barack Obama's visit to Alaska is designed to underscore the urgency. Village residents have been called "the first climate refugees." Those words rankle some in Newtok, who see themselves as resilient. They call those moving to the new site "pioneers." Still, attention may bring benefits, said Tom John, the tribal administrator and nearly lifelong Newtok resident. "Now we're on the world stage," he said. "I thought we were forgotten village." 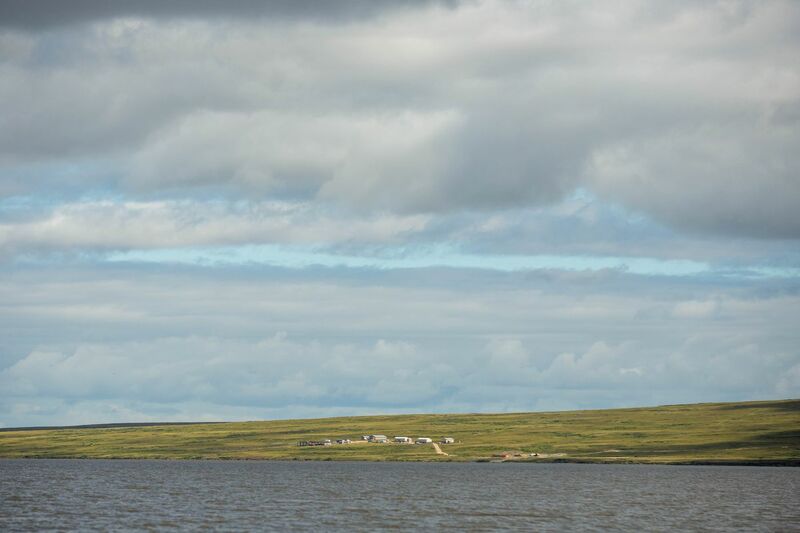 The village of Newtok, seen from the Ninglick River on Wednesday, August 5, 2015. Yup'ik people have lived in the soggy Yukon-Kuskokwim Delta for 2,000 years. For most of that time they were semi-nomadic. Floods brought them to a spot near the current village in 1949. The village site was as far up the Newtok River as a barge could travel and the Bureau of Indian Affairs wanted to build a school. Elders say they used to see the village from miles away in the ocean but no more. Now a few minutes out by boat, houses and even the school look like they are floating in the Ninglick River. "What is going on in the Newtok area is a combination of land subsiding and sea levels slightly rising," said Rick Thoman, a National Weather Service climate scientist based in Fairbanks. The land is sinking a little bit, he said. "When you are only inches above sea level, that is all it takes." The big issue is erosion, according to Sally Cox, a state planner who is working with a number of imperiled villages. Air temperatures are up 2 to 3 degrees since 1950. That causes permafrost in the riverbank to thaw more quickly and accelerates the natural clawing of the Ninglick River into Newtok shorelands. 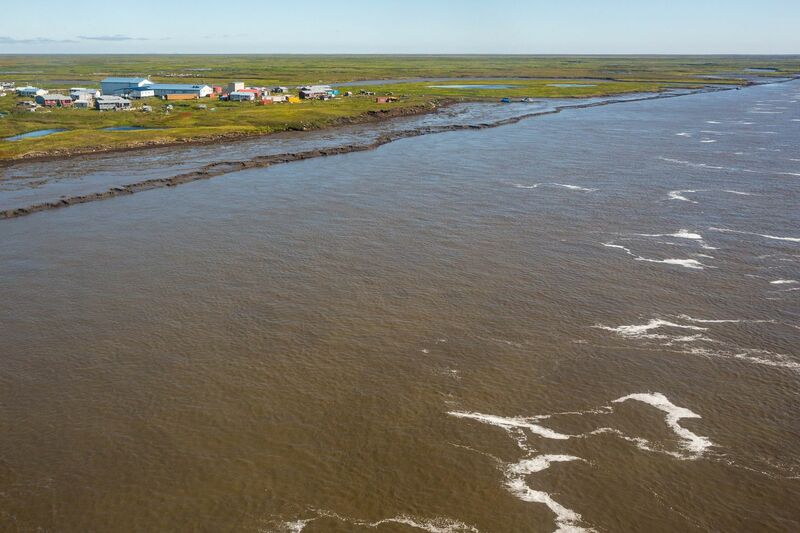 Serious erosion threatens the viability of 26 Alaska villages, including Newtok, according to a 2009 Army Corps of Engineers report. Five more are in trouble because of severe flooding, according to a Government Accountability Office report the same year. Four, including Newtok, were described in a 2003 GAO report as "in imminent danger" and preparing to relocate. On the coast, late-arriving ice packs leave villages exposed to pounding waves in fall storms. All around, traditional winter trails form late or become unsafe early. As permafrost thaws and land sinks, the risk of flooding increases. The number of federal disaster declarations in Alaska because of storms and flooding is off the charts in recent years, said Katherine Eldemar, director of the state Division of Community and Regional Affairs. Disastrous floods ripped through Newtok in 2005, 2006 and 2013. It's "a stealth change in our climate," she said. Storms tend to do more damage than in the past, said John Walsh, chief scientist at the International Arctic Research Center at the University of Alaska Fairbanks. But, he said, researchers have not found evidence that storms have increased in intensity or frequency. The village of Newtok, in southwest Alaska, on Tuesday, August 4, 2015. The community has lost three miles of shoreline to the Ninglick River over the past 60 years, and is in the process of moving to a new site on higher ground 9 miles away. Two of the most threatened villages, Kivalina and Shishmaref, are still working on a process to identify a new site. Around Kivalina, thinning shore ice often is too unstable for whale hunters to pull their boats across in spring. Houses in Shishmaref are on skids, ready to pull to higher ground. Another, Shaktoolik, has decided to "stay and defend," said Cox, the state planner with Community and Regional Affairs. Newtok is not waiting. Village residents picked their new site in a 2003 community vote. Congress approved a land swap that year between the U.S. Fish and Wildlife Service and the Newtok Village Corp. Residents say the Ninklick River long ago used to be distant, maybe two or three miles out. Estimates from U.S. Geological Survey maps indicate the Ninglick has consumed maybe a mile of tundra since 1954. Whatever the rate, the river now is about 50 footsteps from the closest homes and moving toward the school. "One day I'll probably be able to seal hunt right out here," said Nathan Tom, 31, gesturing as if he's holding a rifle from his living room window. The red house where his grandparents raised him is one of the closest to the Ninglick. It is among the first dozen homes that the tribe wants to haul across to the new site. The Newtok team is evaluating whether to barge the homes across in summer or drag them over the winter ice. Monica Kasayuli, 65, is raising six adopted children in her home, another one marked for relocation. She's been told a crew will take down the walls, then reassemble the home on the other side. "Same as the way it was built," she said. "We had a picnic and Eskimo dancing," Kasayuli said. "It's really beautiful across there, lots of rocks and bushes. We even went blackberry picking." Gov. Bill Walker, in an Aug. 6 letter welcoming President Obama, said relocating threatened villages is essential to maintaining traditional culture. "This is about more than just moving buildings," the governor wrote. "We have an opportunity to create a model for economically and environmentally sustainable living in the Arctic." In Newtok, an energy-efficient home is being built through the Fairbanks-based Cold Climate Housing Research Center. It will be on skids so it can be hauled to the new site. Planners expect the new village to run on wind turbines as well as a diesel-fueled generator. Late one August afternoon, the new village site was eerie but not empty. Children and dogs scampered about. "Taitai," one called a dog, Yup'ik for "come" but also the dog's name. "It's a good place around here," said Mary George, who along with her husband, Mark George Sr., occupies one of the first homes. It's perched high on the hill. "No more scaring of flood." The new site is clean, and quiet, she said. Family members have visited and picked blackberries. The couple is only there part-time. Mertarvik is a settlement, not yet a village. There is no clinic, no mail delivery. The couple's only electricity is from their generator. They are still on honey buckets and pack their own water. A well and septic system have been built for the evacuation center. The new village should have either a community-wide piped water and sewer system or individual wells and septic tanks, said Greg Magee, manager of the state Village Safe Water program. "We need roads, clinic and airport," George said. Three homes are occupied but no families yet live there year-round. Without more families, a new school can't be built. Grant Kashatok, who is starting his 11th year as Newtok principal, said at first, children probably will be home-schooled, with support from the Lower Kuskokwim School District. Once enough children live there, and the evacuation center is complete, it could serve as a temporary school. Maybe he will volunteer to lead it. "I wouldn't mind taking that role as the one-room schoolteacher for everybody," Kashatok said. "Doesn't that sound like the wild, wild West?" Three homes, built lower down from the rest under the prior tribal council, are unoccupied. John, the tribal administrator, said the original owner of one of the homes has died and the men who own the other two are disabled. He is uncertain why other family members haven't moved in. No one has a blueprint for how to move a village, the homes and the school, the clinic and the stores, maybe even the graveyard. "We are like in a fog, and we're just feeling our way to the future," John said. No government agency is in charge. Yet the move slowly is coming together. The state calls the Newtok effort a model – the village is the driver, and regional, state and federal agencies are on board. The Army Corps of Engineers in 2006 estimated Newtok's relocation cost at up to $130 million – that works out to almost $2 million per household – but it will likely end up being much less, said Cox, coordinator of the multi-agency Newtok Planning Group. The move is happening in stages, she said, so there's no big hit all at once. A community layout has been platted. An airstrip is designed. Roughly $27 million in state and federal dollars has been allocated for studies, an environmental assessment and the design and construction of "pioneer infrastructure," she said. Not all has been spent. Plus, Newtok Village Council says another $10 million has been committed to build a road to the Mertarvik airport, which includes $4.1 million from a state transportation bond plus BIA grants. The use of a military team helped keep labor costs down, Cox said, as did Newtok work crews that built the new houses. Military members came from around the country as part of the Innovative Readiness Training, mostly through the Marine Corps. The Army sent a landing craft. The Navy worked on the rock quarry. They built sturdy storage buildings — two of which could be converted into temporary housing — and put in an initial road reinforced with durable mats. The Newtok tribe in July applied for $4 million in federal-state hazard mitigation grants to move the 12 homes and pay owners for five others too dilapidated to move, providing money so they can build at the new site. Back in Newtok, life never was easy and has been getting tougher. Houses are crowded and in rough shape. Some village infrastructure is in disrepair. When Sophie Simon's home burned in a fire, she moved to a little yellow house, the oldest one in Newtok. But it was too moldy. Now she lives nearby. One bedroom looks out over the village garbage pile. The floors are uneven and the foundation is too rotten to level, she said. Yet it's a happy place, home for now. She wants to rent-to-own at Mertarvik. Around the village, multiple generations pack into homes where crowding allows disease to spread, say community health aides. People seek help at the clinic for impetigo infections, strep, pneumonia and other serious respiratory illness. Nine people are living at health aide Rosemary John's house, including seven children. It's on the list to be moved. Health aides say relocation will be worth it, if there's good housing and running water for all. "Sometimes I don't want to move to the hills," said health aide Lucinta Carl, whose small duct-taped home is on the other list, destined to be torn down. "But I want to have a better house." After a critical piece of land was consumed by the Ninglick in 1996, the bordering Newtok River became a shallow slough. Newtok now is isolated on its own tiny island. Supply barges can no longer land on the Newtok River. They must anchor a ways out, on the Ninglick side. Most goods are flown in. Residents must carefully time boat trips for fishing or scouting moose to high tide so they don't get stuck on shoals. At the current site, only the school, some teacher housing and the village clinic have running water. Everyone else uses honey buckets that are dumped into the slough or the river. Human waste ends up on the mud. People walk through it to get their boats. During floods, raw sewage runs through the village. The village dump washed away years ago. Tribal workers on four-wheelers collect trash bags on sleds and pile them up at the village edge, near homes and the electrical utility office. The new dumpsite is across the Newtok River. The bags as of early August had been piling up since spring. The environmental program was awaiting an outboard motor so its boat can haul the trash there. The village water treatment plant isn't working either. The water is pumped from a pond and is supposed to be filtered and disinfected, but the plant's equipment cannot bring the water to standards for drinking. Residents have been on notice to boil drinking water since 2012, according to Magee, the state water project manager. Residents haul water from the community tank or collect their own. It's a workout. Families reuse laundry water for multiple loads, and don't rinse, several women said. The machines don't work at the community laundromat. As to the catawampus boardwalk, repairs are planned with local crews, said Romy Cadiente, the tribe's relocation coordinator. The tribe is seeking $1.1 million in grant money for urgent projects in Newtok including a boat dock, a fence around the dumpsite, and repairs to the boardwalk from the airstrip, he said. Relocating the entire village is still years away, tribal leaders said. People need to have a safe place to live until then. Upkeep was neglected during a tribal dispute, current leaders say. A clash among competing groups over who led the tribe — and who was eligible for tribal contracts and grants — stalled the relocation project for two years. Some residents complained that members of the old Newtok Traditional Council had served for years without standing for election. There were concerns that the spending process was not transparent, representatives of the new tribal group said. A new council was elected in October 2012. The old council protested. In July 2013, the regional director of the Bureau of Indian Affairs recognized the new group, now called Newtok Village Council, but the decision wasn't fully effective until May 2014. The Board of Indian Appeals upheld it in an Aug. 6 ruling. State agencies as well as federal agencies now say Newtok Village Council is the legitimate governing body. Rifts still run deep. The old council has refused to turn over financial records and equipment, John and others said. It continues to run bingo and pull-tab operations out of the old tribal office. In April, the new council, which operates out of the Alaska Army National Guard Armory, sued to stop the old council from misrepresenting itself and to recover tribal records and property. Representatives of the old council never responded to the lawsuit and lost the case by default. Stanley Tom, tribal administrator for the old council, has spent years working on relocation. He traveled with a brother and a human rights lawyer in 2012 to Papua New Guinea for work on how local communities vulnerable to erosion can take charge. He said in an interview in July that the old council had made its case to be seated. After the appeals court ruling against the old council, he referred calls to its president, Andy Patrick, who said he was tired and stressed but his initial reaction was to fight on. "We've been discriminated against," Patrick said. "We've been railroaded. We are isolated in a small village." Myron Naneng, president of the Association of Village Council Presidents, said he has been trying to get the two sides to come together. Village residents have been working so hard. The unfinished evacuation center should be a village showcase, he said. Leaders of the new council say they are moving on and things are lining up. They are grateful government agencies are sticking with Newtok after so much time. The new council is planning to hold its first election since 2012 in October. Stakes are high to do the move right, said Cadiente, the new council's relocation coordinator. "There are 400 of us who are waiting." One report on Mertarvik uses a Yup'ik word to represent the time when everyone is there. "Piciurtellruuq," the people may say. "It became true."